91 1414170000) on Tuesday the 9th of January 2018. Facilitate face-to-face discussion amongst the team and exchange ideas and experiences around water infrastructures and water contexts. Expand participation in the network through engagement of partners in Rajasthan including Indian water policy and management organisations (govt. of Rajasthan) as well as local arts organisations and artists. Facilitate discussion about where and how Indian artists are already engaging with the country’s social issues and examine what these practices can offer to the situation of water scarcity in Rajasthan. Discuss and develop engagement and outreach opportunities including the potential for community-oriented arts practices as a means of inquiry. Identify collaborators and opportunities for future grant writing. 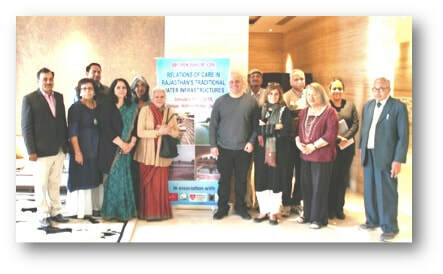 The workshop included a symposium (held at the Hilton, Jaipur), two site visits and other networking activities. Symposium (Hilton Hotel) to explore ongoing works with water infrastructure and rainwater harvesting in Rajasthan and to discuss possible roles and contributions of the arts with respect to water scarcity and conservation. Site visit to village Pachewar, Tonk District of Rajasthan. Site visit to the village Bhandarej (Dausa District), Rajasthan.